Nestled on the main road in Dominical, Danyasa Eco Resort and Retreat is within two minutes distance from the Pacific Ocean. It is located at the bottom of the rain-forested mountains where the Baru River meets the sea. If you are seeking a place for enjoying both adventure and inner exploration. This resort offers a variety of retreats, adventure and creative exploration in Costa Rican paradise. When you will enter the resort, you will experience a feeling like stepping into healing sanctuary. If you want to experience a memorable vacation in a natural setting far from the daily harsh life and want to enjoy adventure activities, Yoga, dance, massage and healing arts, they will find Danyasa Yoga Retreats and Teacher Training perfect. Danyasa Yoga Retreats and Teacher Training offers safe, comfortable and eco-friendly accommodation. There are four rooms in its boutique eco-hotel that you can rent to enjoy a comfortable stay. Each room includes a unique name – The Womb, Ganesha, Lakshmi & Durga – the latter three being named after Hindu God & Goddess. All of the rooms are constructed out of amazingly refurbished up-cylced cargo containers with secure doors and windows. There are ample spaces suitable for keeping or hanging the belongings of the guests. In three of the rooms you will find queen-size beds and air conditioning. You will find a shared outdoor kitchen equipped with all the necessary ingredients, refrigerator and stove. There is also a private outdoor jungle shower, shared deck and community area. This resort also provides WiFi facility that will allow you to stay connected with your friends ad family. If the yoga studio is not in use for any class or private session, if you want to practice your workouts, you can access to it. Danyasa Yoga Retreats and Teacher Training center offers different types of classes that are customized for anyone from any level. All the classes are held in its Bamboo Yoga Play studio. This center has a mission to introduce the practitioners to their true self hidden inside the inner self and to discover the real nature of themselves. Other missions are to offer a sanctuary for creative exploration, healing, retreat and play. These sessions are to support the practitioners to unite their mind, body and soul. Whether it is a dance class, a yoga session or healing arts, each of the step or movement will help the participants to find out a new self and a new world. All the teachers and staff of this resort are friendly, joyful and sharing. 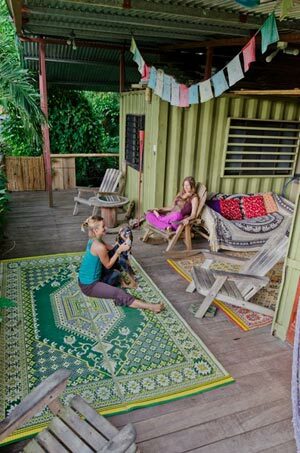 Bamboo Yoga Play studio is the heart and soul of the Danyasa Eco Resort. This 1200 square feet open air studio is constructed with netted half walls, high ceilings and bamboo flooring. In this studio you will also find art soud system, Yoga play swings, a wall mirrors and different types of Yoga props including blankets and bolsters. This is a magical space for learning yoga, dancing and enjoying the movement arts. This studio is located just three hours south of San Jose and two hours from the tip of the Osa Peninsula. 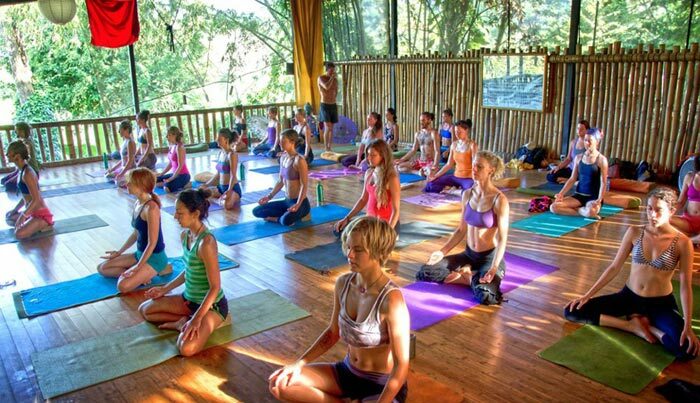 Surrounded by the Baru River and lush mountains this studio overlooks amazing views of the ocean, river and jungle and the natural light and fresh air makes the environment more peaceful for enjoying Yoga, dance or other movement techniques. While practicing the workouts in this studio, the practitioners will also enjoy listening the singing birds and watching the colorful butterflies all around and also the iguanas playing outside the netting. Danyasa Eco Resort has a shopping outlet called Bambo boutique and that offers all eco-friendly products collected from across the world. If you are not a guest at the resort, even then you can drop in to the boutique and there you will find organic cotton, bamboo fabric and even locally made organic soaps. You can also buy the products related to Yoga such as Yoga wear, mats, accessories and other yoga props. Danyasa Yoga Retreats and Teacher Training offers 100 Hour Danyasa Yoga Arts Immersion and 200 Hour Danyasa Yoga Arts Teacher Training. Both teachers and students can join the 200 hour Yoga Alliance Certified Yoga Teacher Training Certificate program that is guided by the experienced teacher Sofia Thom. These yoga session also include breakfast and lunch prepared with organic local products. After completing these sessions the practitioners will learn how to live artfully. The mission of theses training sessions is to teach the students how to immerse own-self in leadership and embodiment as a way of life. These training also include a teacher training manual and one waterfall excursion. People who want to spend some quality time getting refreshed and learning art, they can head to the Danyasa Eco Resort. This resort also offers a Yoga and Surf vacation Package. If you love to enjoy surfing, you will catch world class waves year round in Dominical. Just outside of the studio you will find the balmy Pacific Ocean. Danyasa offers discount for this package so people who will visit this resort for yoga vacation, they will also get the opportunity to enjoy surfing.